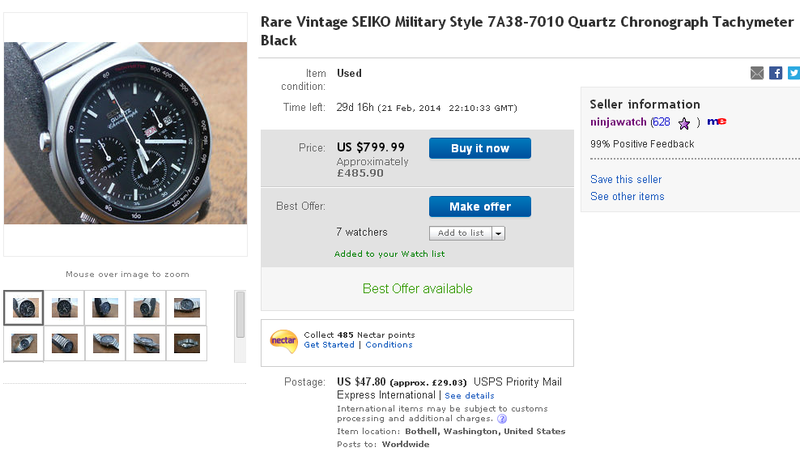 Most of us (and certainly anybody who might have wanted one) will have observed the almost never-ending stream of NOS 7A28-7029 SPR014J's listed by US eBay seller bobcohen over the last 9 months. I've referred to them in a couple of different threads, including this one. The majority of them have sold for around $150, which if 1980's bling is your thing, represents something of a bargain. 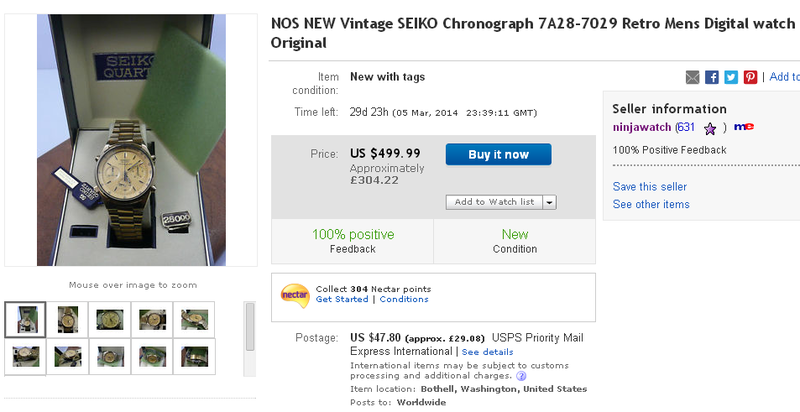 Call me cynical if you like (you know I am), but this appearance of a NOS 7A28-7029 listed overnight by another US eBay seller asking $500 as a Buy-it-Now is just too much of a coincidence. 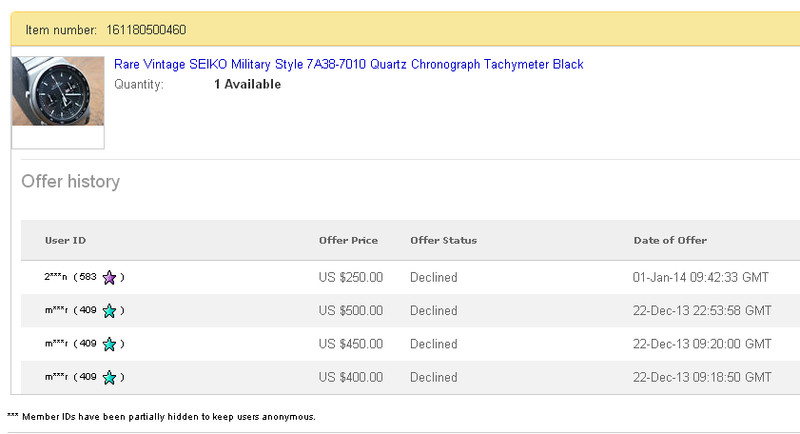 No definitive proof (as yet) - and it's very likely that Ninjawatch uses a different eBay ID for buying. But I'm on the case. Interestingly (and coincidentally) that one was bought by someone with a feedback rating very similar to Ninjawatch (613 vs 612). Those of you already fed up to the back teeth of my various rants, railing against the nefarious activities of profiteering re-sellers on eBay had better look away now - because I'm about to start another one ! Timely_Classic (Steve Jones), Worldwideweb66 (Wai Phyo), Martinachertok, Jeff Resnick, Andrew J Smith - to name just a few. For now, at least, this relatively new topic is going to be kept solely for tracking the profiteering re-selling activities of Ninjawatch. The thing about Ninja's is that they're supposed to be stealthy. This most recent newcomer to try and jump on the 7Axx fast buck profit bandwagon is about as subtle as a wall of flying bricks. Enough of the preambles. Time to bring this thread, kicking and screaming bang-up-to-date, methinks. These things need to be writ. My own fault possibly, in not previously following up on my post of December 6th, but that 7A28-7029 did indeed re-sell for $500 ! It took Ninjawatch less than a week to find a gullible mug punter who clearly hadn't studied the market. Meanwhile, he'd realized what easy money this was and gone looking for another mug punter. Instead, I found this 7A28-7020. I may have missed it while it was live, but once again this other common-or-garden 7A28-7020 gold tone was priced at $499.99. 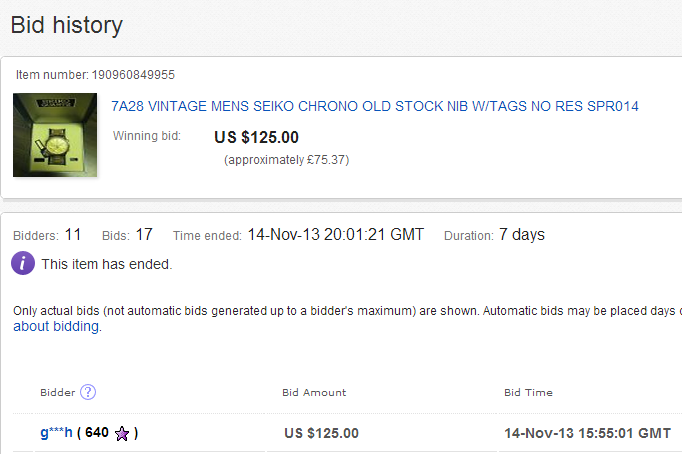 According to Goofbid's eBay Best Offer tool this one sold for a slightly more down-to-earth $232. Still way O.T.T. though. 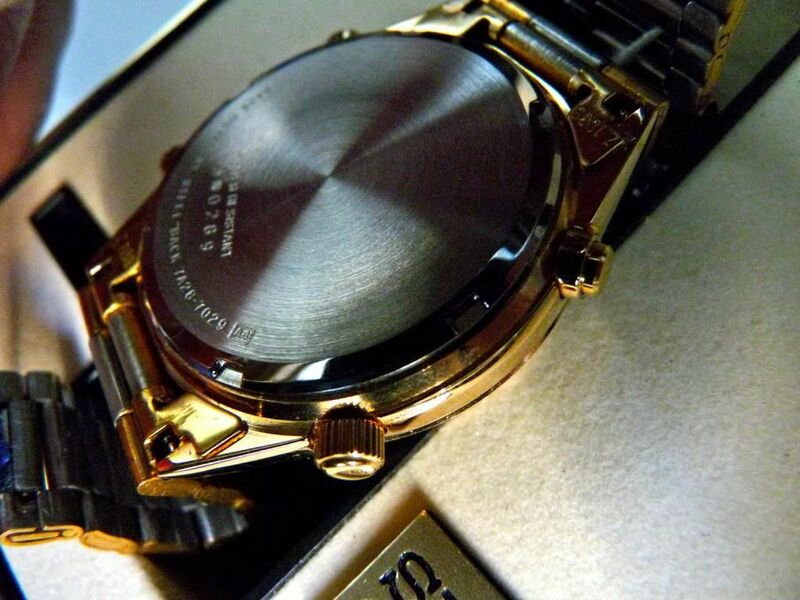 Quite frankly with there being SO many gold-tone 7A28-7020/9's on eBay in the States lately, I'm not about to waste my time trying to figure out which one it was that he bought, nor how much he actually paid for it - but I suspect it was less than a hundred bucks ! No what REALLY p!sses me off about profiteering re-sellers is when they start dabbling in 7A38's. Which is what Ninjawatch did. 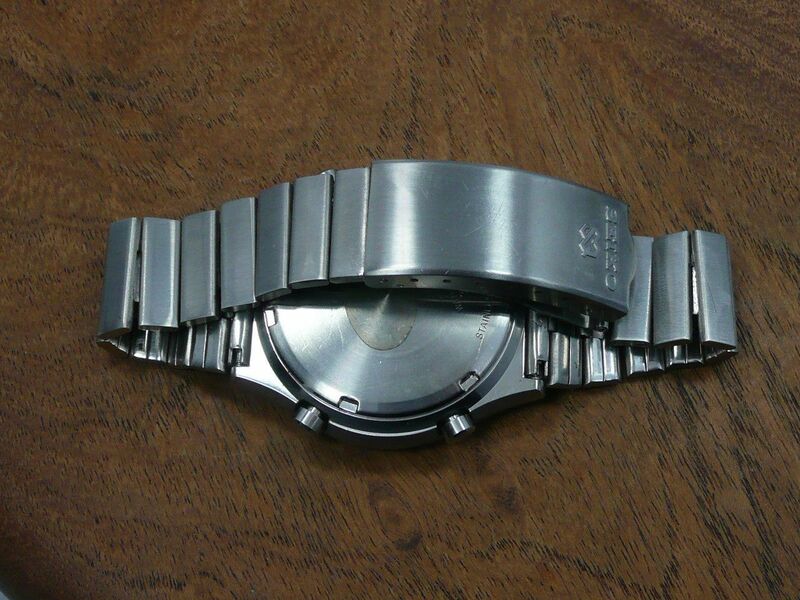 which he himself in winning that auction paid far too much for, then swapped the bracelet for another incorrect stainless bracelet have already been documented in this thread, which I've subsequently re-named and moved to become our 7A38-xxxx model specific topic. So to save myself some time and effort, I'm simply going to copy and paste the relevant parts of / complete posts over into this thread. 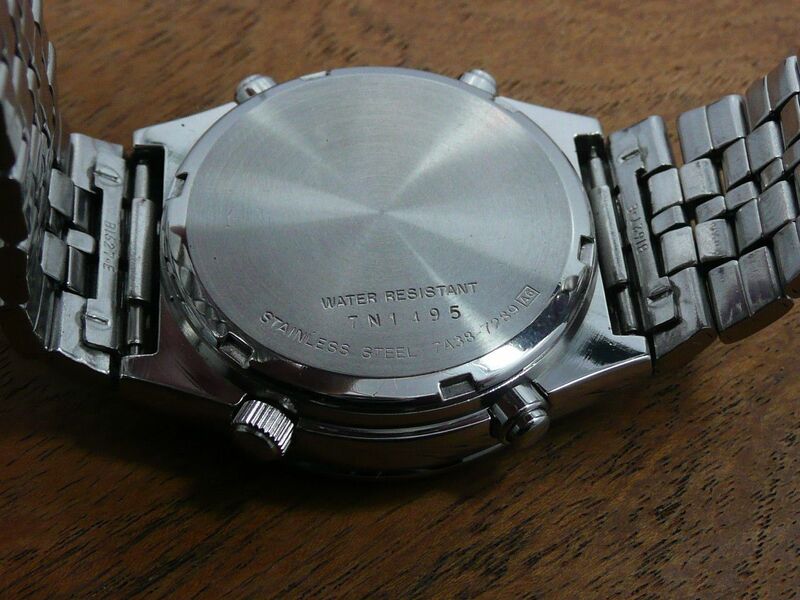 Whether that 7A38-7010 will re-appear at a later date (on another different bracelet) remains to be seen. 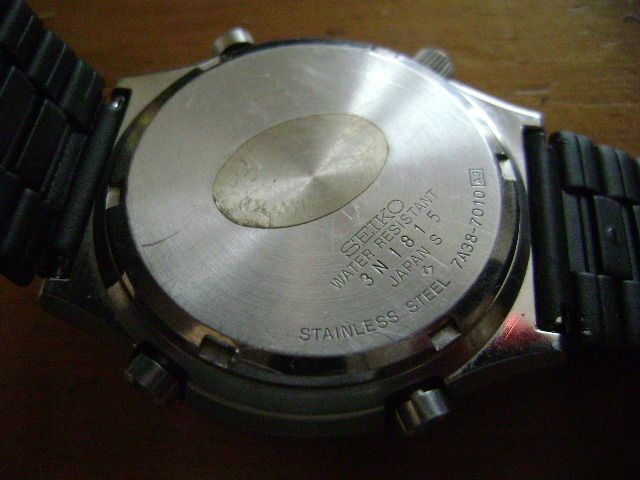 However, if I was Ninjawatch, I would seriously be considering contacting m***r and asking him if he was still interested in buying the watch for the $500 he'd offered back on December 22nd - and if he hasn't already done so, completing the transaction off eBay, rather than face another debacle. Meanwhile overnight, this chancer decided to list another 7A38 at a grossly inflated price: a stainless 7A38-7289 - again asking $500. 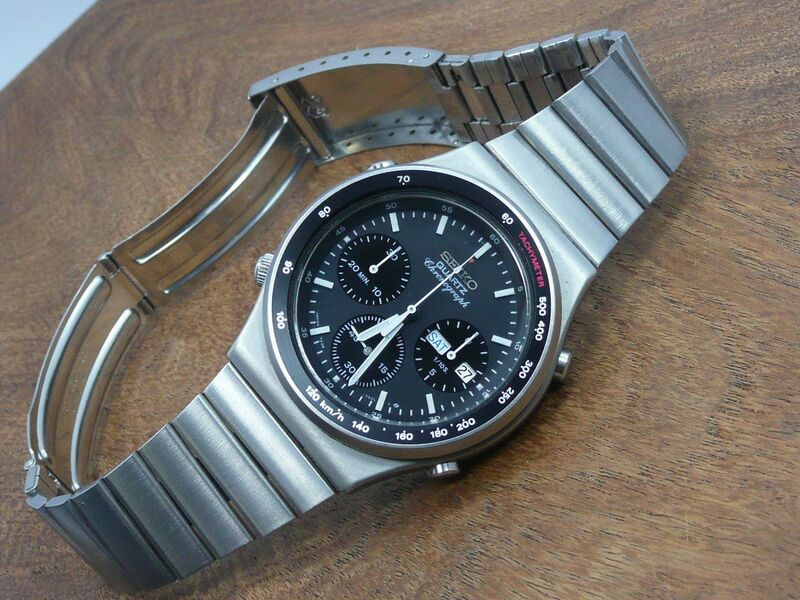 Vintage SEIKO Chronograph 7A38-7289 . 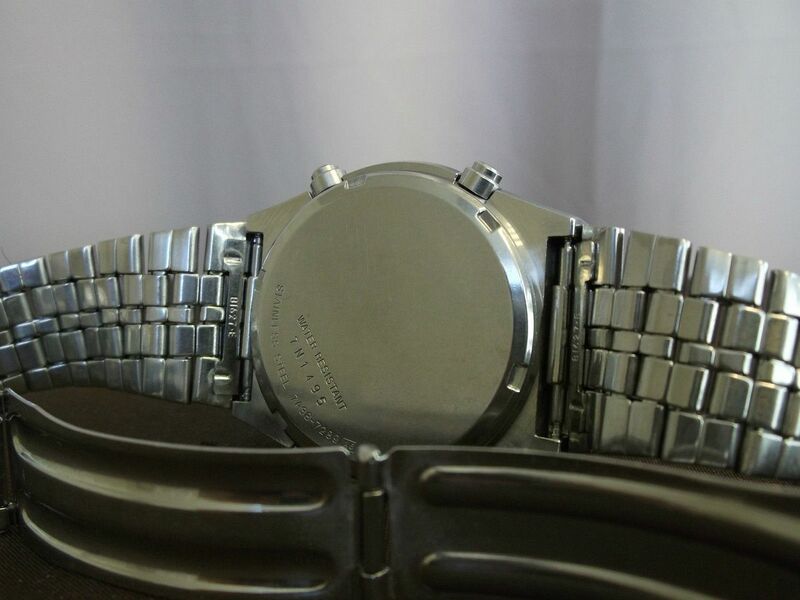 Watch is in excellent condition with light marks from gentle use. Crystal is clean, no scratches. 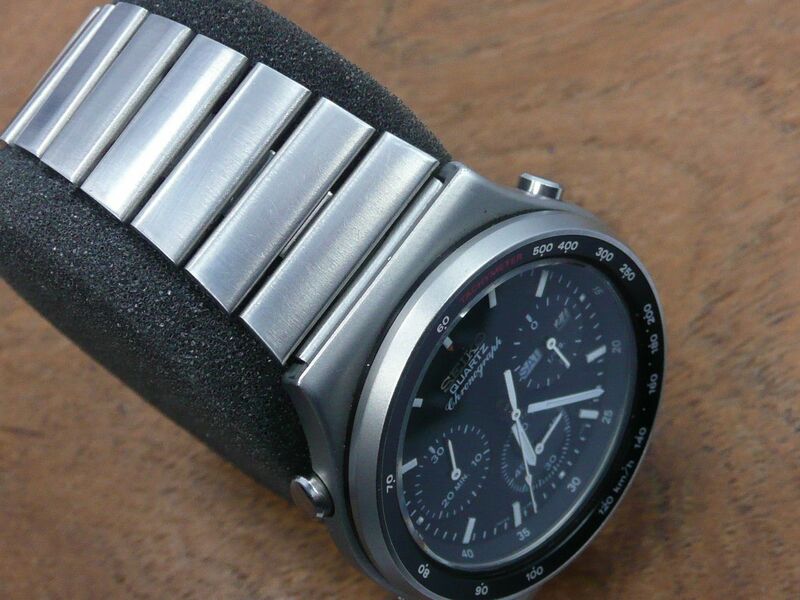 Stainless steel case looks excellent, no dings. Check out my other watches! Trust me, Ninjawatch .... I AM checking them out. Here's where you bought this one - less than a week ago - for $69.99 !! My recent bit of eBay detective work is starting to provide some answers. I certainly was correct about my above assumption. However, I nearly wrong-footed myself earlier. Difficult to explain in a few words, but eBay have made it more difficult to track down individual eBay ID's since they started obscuring buyers ID's in feedback. 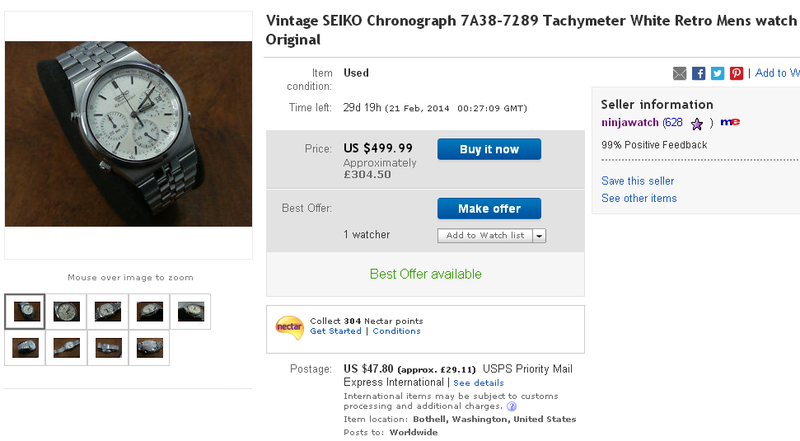 I'd recently noticed a lot of bidding activity on Seiko 7Axx's by an ID that showed in abbreviated / encrypted form as g***h (640). I had initially incorrectly assumed that was the alternative (buying) ID for Ninjawatch - hence why I posted a screen print of their recent activity in my second post on December 6th. I was close, though. To understand, you need to look at the two winning ebay ID's for Bob Cohen's last two NOS 7A38-7029's that he sold. However, g***h (640) wasn't entirely innocent in this matter either. But he did unwittingly help solve my little quandry. .... is going to have to go by the board - because it seems I might potentially have been talking about 2 profiteering re-sellers ! 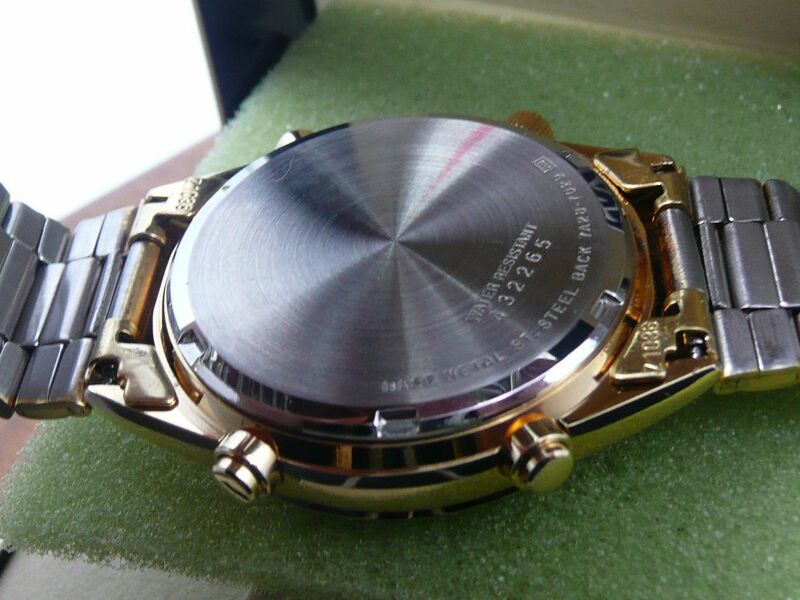 When I clocked the eBay seller's ID - hairspring (640) it clicked immediately - this is the mystery 7Axx bidder / buyer g***h (640) ! Prior to writing this post, I had sent a message to the eBay seller hairspring, giving him a 'heads up' on the existence of this thread. Obviously, he didn't wish to be tarred with the same brush as profiteering re-seller Ninjawatch. I trust that puts the record straight, Don. I just hope the subsequent posts still make sense. The observant among you will, of course, have noticed that in the feedback the abbreviated encrypted ID shows as g***g - not g***h.
That was the point I'd tried to make in my second post: Whoever g***g (or g***h) is, they are either a very active collector or a dealer. 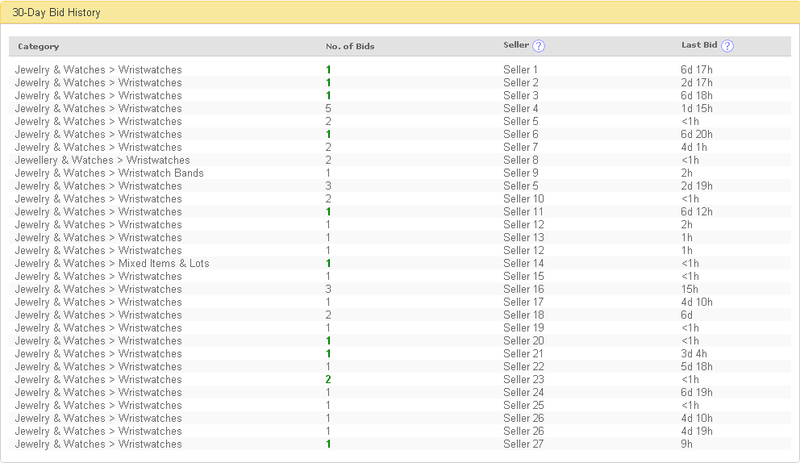 Like I said, eBay's latest form of ID encryption doesn't make it easy. Trying to nail down the other culprit who I now knew was the alternate buying ID used by Ninjawatch proved rather more difficult. Not only does it show there as o***u instead of t***a - but their feedback has also increased from 1649 to 1650 during this evening. Apart from a moving target, I knew I was looking for an eBay ID that included the letters t, a, o, and u, but not necessarily in that order. 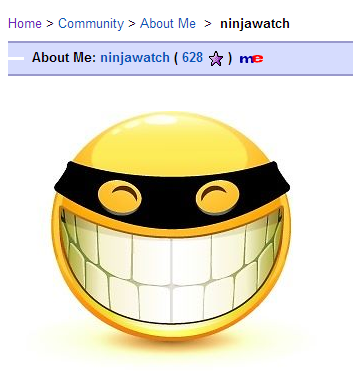 Remembering that I was also looking for an alternate user ID for Ninjawatch, I started searching for an eBay ID that included 'watch'. Ninjawatch has not yet reciprocated on either of these. Perhaps he delays leaving feedback until after he's re-sold the watches. There may be no obvious connection in the choices of user ID's, but both give their locations as: Bothell, Washington, United States. Aw Don !! You're not actually gonna sell (i.e. mail it to him) are you ? Must take watch to Post Office, so I can tell everyone how glad I'm retired from USPS ---> again ! Look, Don. I don't want to come over all high-handed, but .... PLEASE DON'T supply it to him. Refund his money and tell him to F off, just like he told you, when you messaged him about the 7A38-7010. You know what will happen: 5 days time it'll be back on eBay with a minimum $499.99 Buy-it-Now price tag. And he will find another mug punter. Just like he did with the last NOS 7A28-7029 he got from Bob Cohen. Took him less than a week last time. Or think of it this way - it's $375 profit YOU could be making yourself, instead of that profiteering S.O.B. ! 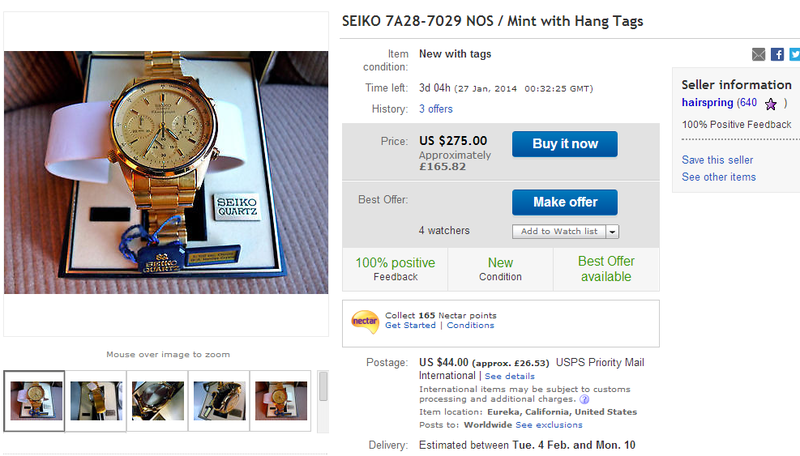 Not exactly a surprise - ANOTHER NOS 7A28-7029 with a $500 price tag ! .... just that it took Ninjawatch so long. 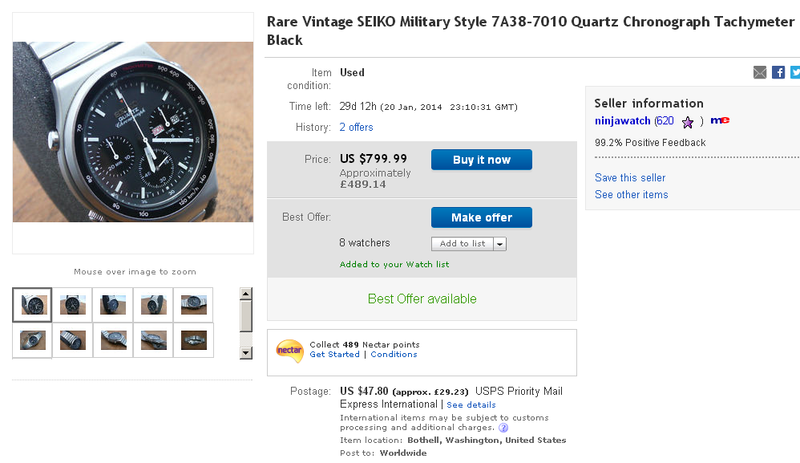 This is presumably the same NOS 7A28-7029 which Don sold to Watch-co-usa / Ninjawatch for $185 a little over a week ago. 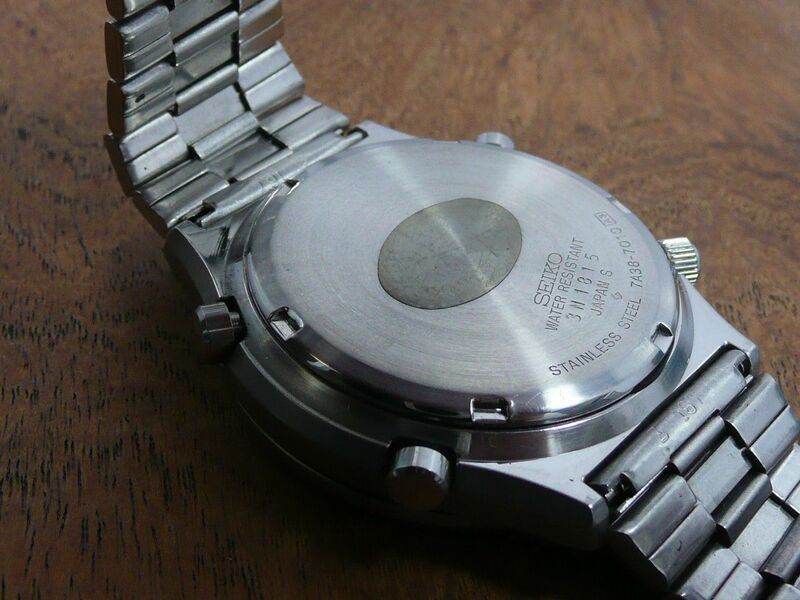 However, if you check the case-back serial number in his last photo - # 432265, it doesn't match Don's, which was # 3N0289. Ninjawatch has conveniently re-listed his earlier listing which ended on 11th December, thereby carrying forward that set of photos. By the way, Don .... Has he left you a glowing positive feedback for the 7A28-7029 yet ? Maybe, because I havn't left any for him ?